Uruguay is a small country on the southeastern coast of South America. Most Uruguayans are descended from Spanish settlers who came to the country in the 1600's and 1700's and Italian immigrants who arrived during the 1800's and early 1900's. Spanish is the nation's official language. Most Uruguayans live in urban areas, Montevideo, the capital and largest city, has about half of the nation's total population, and serves as the commercial, political, and cultural hub of the nation. Mild climate and abundant natural pasture with large cattle and sheep ranches are the main base of the economy. American Indians were the original inhabitants of Uruguay. Spanish and Portuguese forces fought for over Uruguay during the 1700's, and Brazil later tried to dominate the country. In 1828, Uruguay became an independent republic. It developed into a prosperous and democratic nations in the early 1900's. During the 1950's, 1960's and 1970's economic decline brought about a period of unrest and military rule. Democratic governments have ruled Uruguay during most of the 1900's, but remains saddled with substantial external debts. 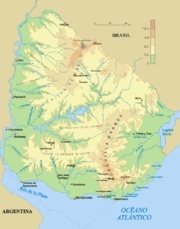 Most Uruguayans belong to the Roman Catholic Church. The government provides free public schooling up to university level. Temperatures in Montevideo average 11 °C in July, the coldest month, and 23 °C in January, the warmest month. Good roads and railway system link all parts of Uruguay. An excellent government-operated bus system that serves the entire nation. Montevideo serves as Uruguay's major ocean port. The main international airport is located near Montevideo. In 1825, a group of Uruguayan patriots called "The Immortal Thirty-three" revolted against Brazil and renewed the struggle for independence. Within a few months, their armies held much of the countryside. Argentina and the British supported the patriots in the war against Brazil. In 1828, Brazil and Argentina recognized Uruguay as an independent republic. In 1836 civil war broke out between Colorados (mainly urban dwellers) and the Blancos (rural dwellers and ranch owners). Even today's main parties are successors of these parties. Montevideo is the capital, largest city, and chief port of Uruguay and is situatiated where the Rio de la Plata meets the Atlantic Ocean. This heritage makes Montevideo seem much like a European city. For more information about Southern Fuegian Railway see Wikipedia, the free encyclopedia. Links to my photo pages in this Uruguay 2002 series.